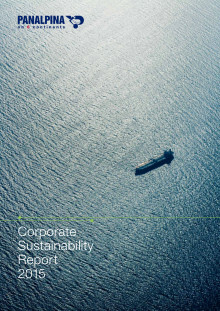 Panalpina has published its 2015 Corporate Sustainability Report, highlighting its approach to sustainability and corporate responsibility and the actions it took during 2015 to provide sustainable value for all stakeholders. The report explores the methods Panalpina used in 2015 to engage with its stakeholders and to assess its impacts on the environment and the communities where it operates. 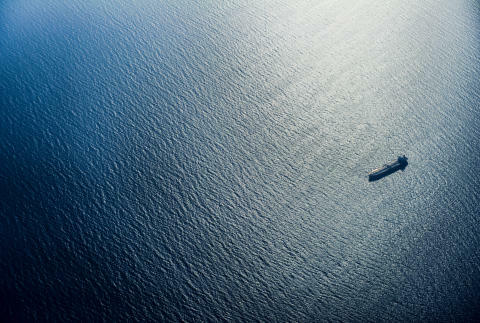 Prepared in accordance with Global Reporting Initiative (GRI) G4 Guidelines, the report demonstrates Panalpina’s comprehensive approach to analyzing its activities and impacts and evaluating how sustainability relates to its strategy. 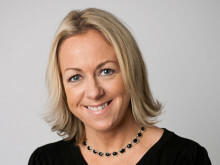 “Panalpina’s corporate sustainability programs and reporting are continuously evolving to meet the expectations of our stakeholders and to reflect our increased understanding of where our impacts and opportunities are greatest,” says Lindsay Zingg, global head of quality, health, safety and environment at Panalpina. During 2015, Panalpina continued its commitment to reducing its environmental impact, with a focus on greenhouse gas (GHG) emissions. At the UN Climate Talks in Paris held in December 2015, it was announced that Panalpina was one of over 100 international companies and the only logistics company so far to commit to set reduction targets as part of the Science Based Targets Initiative. 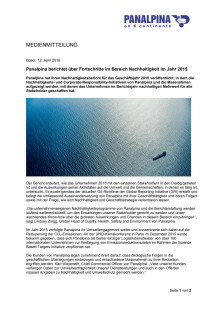 Panalpina’s 2015 Corporate Sustainability Report is available as a PDF. The Panalpina Group operates a global network with some 500 offices in more than 75 countries, and it works with partner companies in a further 90 countries. Panalpina employs over 15,000 people worldwide who deliver a comprehensive service to the highest quality standards – wherever and whenever.